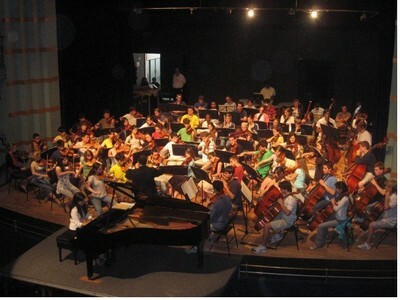 Every summer, countless American youth orchestras, choirs, and bands embark on international concert tours designed to give young musicians some exposure to the world outside their own comfort zone, and for the musicians themselves to act as ambassadors for our own musical culture. Dozens of my own friends have gone on tour with their youth orchestras, and I've heard how exciting it is to travel and play together in foreign cities. So, this fall, when I learned that the Philadelphia Youth Orchestra would be touring Brazil in early July, I was dying to go. I'm particularly interested in Brazilian music and culture, having studied capoeira for several years. And who would pass up the opportunity for a music-filled trip to of the most exciting countries in the world with fifty of their best friends? But my parents said that orchestra tour would be expensive and that I wouldn't get that much out of it because intensive orchestral playing wouldn't be good for my technique. Finally they agreed to let me go—reluctantly—after I proposed to pay for the trip out of my own savings. I was thrilled. Ours was to be a fairly intensive tour—seven concerts in eleven days, playing quite a bit of new repertoire from our regular season. To prepare us, our conductor, Maestro Louis Scaglione, called for a month of intensive rehearsals, as much as six hours a day on weekends, after our regular performance season ended. Like most youth orchestras, we're a little spoiled because our usual audiences are predisposed to love us unconditionally. Our farewell concert in Philadelphia's swanky Union League was packed with the usual mix of parents, grandparents, board members and friends. Under the baton of Maestro Scaglione, we performed one of the several programs we would use on tour: the overture to Mozart's opera La Clemenza di Tito, Beethoven's Eroica Symphony, and the Tchaikovsky Violin Concerto with our concertmaster Francesca dePasquale as soloist. We got our usual standing ovation, and felt pretty good about the performance. 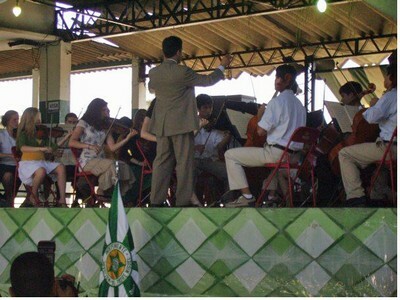 Our conductor and chaperones assured us that the Brazilian audiences were going to love us, too. But I had to wonder what kind of reception would we get from a hall filled with total strangers. We flew as group, directly from Dulles Airport in D.C. to the now-infamous Sao Paulo airport. 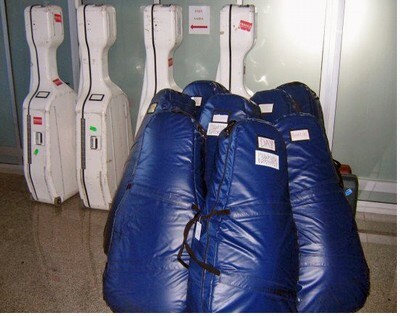 Because we were on a commercial flight, there was no crating for the instruments, so the cellos and basses were placed in the hold, in flight bags, along with the rest of the luggage. This caused some anxiety, particularly among the cellists who are used to bringing their instruments on board and buckling them into seat belts. We small instrumentalists felt lucky to be able to carry our instruments into the cabin with us. When we landed, we learned the cello belonging to my friend Genevieve Tabby was missing. 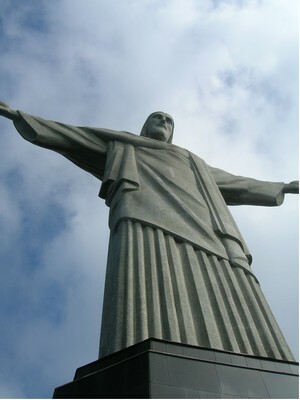 It had traveled on its own to Rio de Janeiro! Basses, left, and celloes, right, lined up in their flight cases. Fortunately, the errant cello was soon located and returned to our hotel in the wee hours of the next morning, just in time for Genevieve to perform with the rest of her section in the first concert of our tour, in the Teatro Municipal of the city of São José dos Campos. That first concert in Brazil turned out to be one of the most exciting nights of my life! The venue itself seemed rather strange to us at first, from a cultural perspective. Instead of being in a fancy concert hall with wooden and red velvet chairs, the auditorium was situated in a shopping mall. The hall itself looked like a movie theater, with big, comfortable reclining seats. During our performance, the audience behaved more casually than audiences at home. Although they were attentive, they seemed more physically relaxed than the audiences we are used to. They behaved as if they were watching a movie or a spectacle, rather than somberly partaking of classical music. They tended to clap between movements and express their appreciation without reserve—which didn't bother me a bit. At the end they leapt to their feet and cheered. My friends and I looked around at each other across the stage, amazed and delighted that they liked our performance so much! We are used to playing for audiences who are pre-disposed to liking us -- our parents and friends – yet no audience had ever reacted this warmly to our playing. The next day, after some sightseeing, we boarded our busses for a trip to the city of Santos where we gave an evening performance at the Teatro Coliseu. While we were warming up in the girls' dressing room backstage, my friend and fellow violinist Charlotte Nicholas noticed a strange, burning smell. 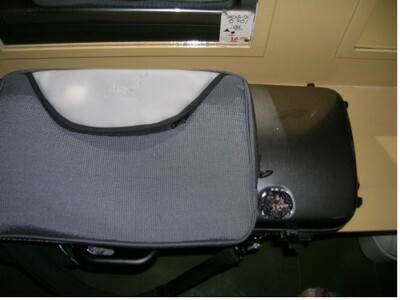 We looked up and saw smoke rising from my brand-new BAM High-Tech violin case. I snatched the case away from the vanity lamps by the mirror, but it was too late. A huge and very odd-looking hole had burned its way into the exterior of my case! This concert had a younger audience than the first, and a group of adolescent boys in the first few rows kept pointing at the girls in the orchestra and whispering and laughing as we played. We weren't sure what to make of their behavior, but after the concert we found them waiting at the stage door where our buses were parked. They kept pointing to names on the printed program and trying to match us with our names. They were quite friendly and we attempted to hold a conversation with them, but since our Portuguese was even worse than their English, we all ended up laughing. The second violin section in rehearsal. The next day, we gave a late-morning performance at the Teatro Cultura Artistica in Sao Paulo. This was our concertmaster Francesca's final solo with the full Tchaikovsky. (She would play the first movement at our last concert at the Samba School.) We were so proud of her for performing the entire concerto four times in such a short span. She's an amazing technical player with great stamina and clear musical ideas. orchestra and our chaperones to be distributed throughout only two floors. In the bright light of morning, our rooms seemed much less intimidating, and we ran through the halls to each others' rooms, excited for the great day that we had planned. By now our chaperones were undoubtedly weary, but we were as rambunctious as ever, just getting our second wind! The next day we made our obligatory visit to the Corcovado Hill with its iconic Cristo Redentor statue, one of the New Seven Wonders of the World! As we rode the cog train on the way up the steep mountain, we got to hear our first taste of live Samba music! A band of four musicians joined us on the train, playing: a small instrument like a banjo, a drum, a washboard/screwdriver combination, with the last one singing and dancing. The music was so exciting, it had us all clapping and jumping around in our seats. At one point, the singer invited us to dance samba with him. Of course we couldn't refuse! PYO and samba musicians mixing it up on the cog train. Later that day we made our way to the Copacabana beach (what's a trip to Rio without a visit to Copacabana?) We spent the afternoon away from our instruments, frolicking in the surf, enjoying the beautiful scenery, and dodging the hang gliders landing from their flight off a nearby mountain. PYO members dodging the hang gliders at Copacabana Beach. After a couple days off from performing we were pumped for another concert. This one was in the town of Petropolis where we performed as part of the Petropolis Winter Festival. There met our piano soloist Sylvia Thereza for the first time and rehearsed the Schumann Piano Concerto with her for about an hour. It was astounding how well she fit with the orchestra after so little rehearsal. She's only a little older than some of the kids in PYO, so she was a real inspiration to us. Our first rehearsal with Brazilian pianist Sylvia Therman. Next day, we were bussed to the stately Rio Teatro Municipal for our second performance with Ms. Therman.The Rio Teatro Municipal, despite its ordinary-sounding name, was the fanciest and classiest venue of our tour. The audience members themselves were also different from the other audiences we had encountered on the tour. This was the high-society crowd of Rio de Janeiro, and there was no clapping between movements. Although I would not describe our reception as cold, it was clear that these people were more reserved and less outwardly responsive to our playing. In fact, the atmosphere in this hall was similar to what we were used to back at home. The next morning we returned to the Teatro Municipal for our last official concert in Brazil -- a children's concert for several school groups, middle school through high school. This concert was our most informal, and we narrowed down the repertoire a bit to appeal the best to their interest and attention span. We played the Overture to Handel's Royal Fireworks and Brandenburg No. 2, the first movement of the Tchaikovsky, and the last movement of the Eroica. For most the kids in this audience, this was their first time seeing a classical music performed live – or hearing classical music at all. The response we got was amazing – these kids loved our music! We were so glad and honored to be the ones to present this genre of music to them for the first time. After the concert they rushed up to us outside the hall, asking us to pose for pictures with them. Mobbed after the children's concert. We loved it! Our final day in Brazil was also our most gratifying. The tour guides told us, "We are now going to a slum!" which seemed to like seemed like an odd and surprising admission – maybe it was a translation problem. Where they actually took us was a samba school filled with Brazilian teenagers working on their dance and instrumental skills over their school's winter break. We did a short performance for them and then they performed Samba music for us – it was loud and exciting! Then we all danced, even Maestro Scaglione! Philadelphia Youth Orchestra onstage at the samba school. Photo credit: Ryan Jin Touhill. PYO members dancing at the samba school. Left to right: samba student, violinist Coral Pistilli, samba instructor and me. Throughout our trip, we ate at marvelous restaurants, but I regret the strict instructions from our chaperones not to eat any raw vegetables or fruit that doesn't peel. Too bad, because the fruits and vegetables offered at every meal looked beautiful. While in Rio, I tried my first taste of octopus (which was backed up by some encouragement from my friend Mike Dahlberg, PYO's principal cellist – "You're in a new place, you have to try new food!" he chided.) Then I tried rabbit, with support from my friend violinist Sabrina Tabby, Genevieve's twin and member of our quartet, Seraphina. Though I'm not sure I'm adding either of those to my list of favorite foods (the octopus still had all the suction cups on it!) I'm glad I tried them! At that night's farewell dinner, while standing in line at the buffet, I was astonished to see that the woman standing in line behind me was none other than violinist Sarah Chang, in town herself for a performance. Of course, it is less astonishing that Ms. Chang would have joined us for dinner if you know that, like us, she is a native Philadelphian, and has even soloed with our orchestra in the past. Still, her surprise appearance that night caused a flurry of excitement, especially among our orchestra's violin section, if not the brass players, who were heard murmuring among themselves, "Sarah who?" Exhausted but happy, we embarked on the 20-hour trip back to Philadelphia where our parents were scheduled to greet our bus from Dulles Airport in a sun-baked Home Depot parking lot. During the ride, I remembered my parents' original reticence about the trip and how they had questioned whether this experience would be worthwhile. I knew that as soon as I saw them I would be able to tell them a resounding "yes!" True, I had not practiced my solo music for two weeks, but in exchanged for a little backsliding in that department, I had gained new insight into the camaraderie of orchestra playing. Our youth orchestra performs a fair amount of concerts each year, but our regular schedule of rehearsals and concerts are nothing like the intense experience of an 11-day, 7 concert traveling tour. It was satisfying to reflect on the ways we had been able to communicate through the music we played. Throughout the trip we were isolated from our audiences verbally—none of us could speak Portuguese, and could only talk to them through miming. But concert after concert, we finished feeling that we now shared a special bond with these strangers. Our Brazilian audiences were the most responsive and enthusiastic audiences we had played during in our brief careers. Their warm response to us was a wonderful reward for our hours practice and travel. I came home feeling that I could more than justify the sacrifice of time and the expense of the trip because of this singular affirmation: music really is the universal language. That sounds like so much fun! Thanks for posting the photos and youtube segment. A few other things I'm sure you learned are the thrill of being inside some big (orchestral) music and the nonverbal communication between musicians and audience during the performance. Music is one of the best things to share. What great fun your trip was !!! Thrilling and so lovely !!! Thanks,I shared in your joy--GREAT REPORT !!!!!!!!!!!!!!!!!! All I can say is wow! Caeli... I'm jealous--take me next time so I can practice my Portuguese. Also, I can relate to the audience's response... The times I've seen live classical, it was as cool if not cooler than going to a Rock concert--I think cooler. Indeed, the next time I see a solo violinist, I'm sitting way back in the dark corner somewhere with my box of tissue!. ;p) (p.s. If you ever repeat this I'll say you're lying! ;). Great that you enjoyed your trip to Brazil. Too bad i couldn't see your concert and also Chang's. Maybe next time.